You can select from preset date ranges similar to what is available in the AdWords web interface, or you can pick a combination of start and end, start and duration, or end and duration. 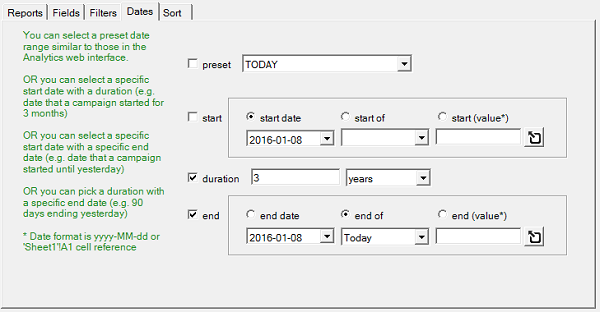 Dates can be selected by specific calendar dates using pop-up calendars, by selecting a preset date offset, or by entering a date value. Date values can also be obtained from Excel cell references by clicking the button at the right. The preset date offset is useful for making reports relative to today’s date: the most recent calendar month, for example. Specific date values could be manually entered in the format of yyyy-mm-dd, or click the button to the right of the field to use an Excel cell reference to a date in your worksheet. This entry was posted in Google AdWords on 2014/03/11 by functions.